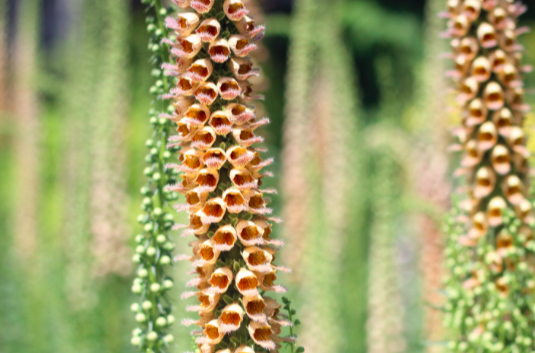 5′ spires of condensed tubular rusty orange/brown densely line the stems of this perennial foxglove in late spring into summer. From a basal rosette of corrugated mid green foliage they rise and delight pollinators and floral arrangers alike. Really cool mixed with wispy ornamental grasses. Full sun and average to rich soil with light, regular summer water. Long lived for a foxglove. I once had one persist in my garden for 15 years! Very dry adapted when established. Basal clumps increase annually and therefore so do the numbers of spikes. 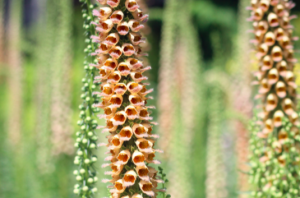 Supremely deer resistant as all Digitalis (we’ve expanded our offering of this genus for that very reason). Semi-evergreen. May reseed in open disturbed soils. Seedlings are easy to dispatch, move, or share with friends.